Last month we launched our new Spaces feature to make it easier to organize reports around teams and projects. Analysts quickly found a good analysis created for one team could be useful for many others. It was just too hard to pick the one-and-only space where a report should live. That's where the new shortcuts feature comes in. Now you can access reports from multiple Spaces by using shortcuts. Analysts can build and maintain a single report, and allow business partners to easily discover the analysis from the Space they visit most. You can create a shortcut from the Query Editor or when previewing a report on the home page. Simply choose Create shortcut from the context menu, and choose the Space where you want to add a shortcut. Suppose you're putting together a presentation for an upcoming board meeting, and you create a Space to organize the relevant reports. 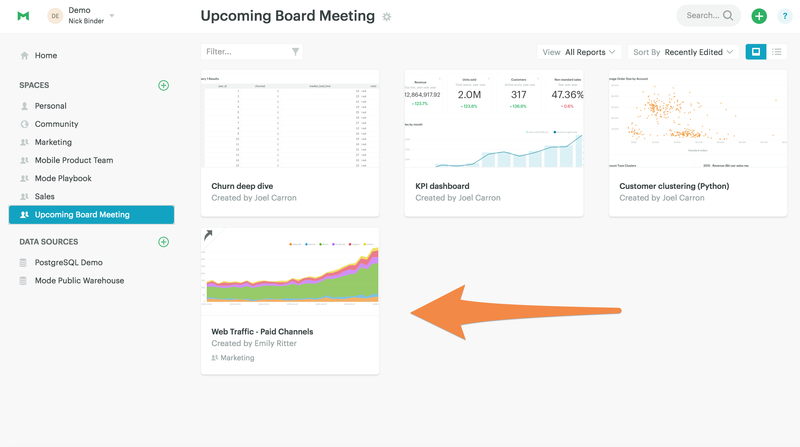 Your marketing team wants to highlight the huge traffic spike they drove last month, and would like to show off their go-to dashboard to the Board. Rather than recreating the report for the Board, just add a shortcut and the report will appear in the board meeting Space. Jump into Mode to experiment with this powerful new curation feature. If you have any questions, reach out to us at hi@modeanalytics.com—we love hearing from you!